CSCI Majors, Truth Iyiewuare ’18 and Alicia Martinez ’18, inducted into ODK! Two Computer Science Majors will be be inducted into Alpha Circle of Omicron Delta Kappa, (ODK) the national leadership honor society, at Washington and Lee University’s annual Founders Day/ODK Convocation. The ceremony will be held on Jan. 18, 2018 at 5 p.m. in Lee Chapel. 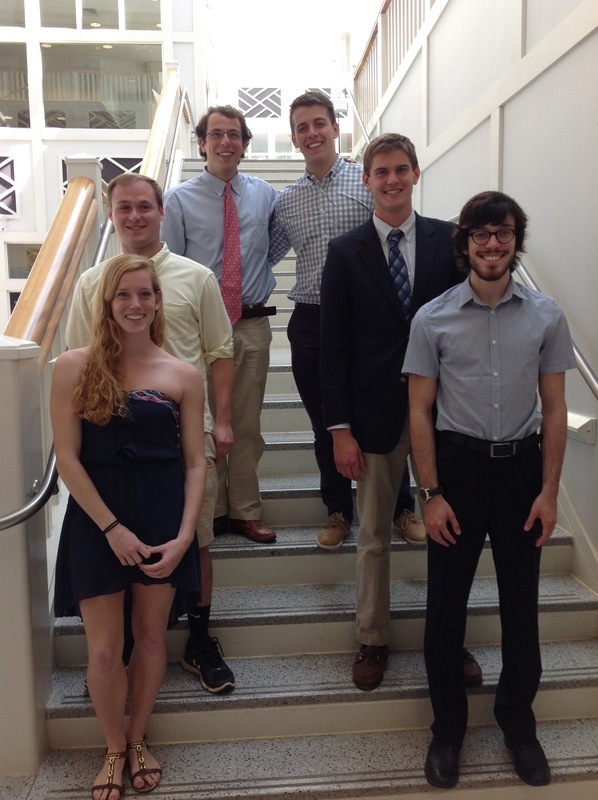 Below are brief descriptions of these students and their many accomplishments. Congratulations, Truth and Alicia! Truth Iyiewuare (Houston, Texas) is a computer science major. He has been a leader in the Student Association for Black Unity, as vice president and now as president. He has also displayed leadership in his major, having worked as a lab assistant for students in the introductory computer science class, and as a peer tutor for other students in need of any computer science help. 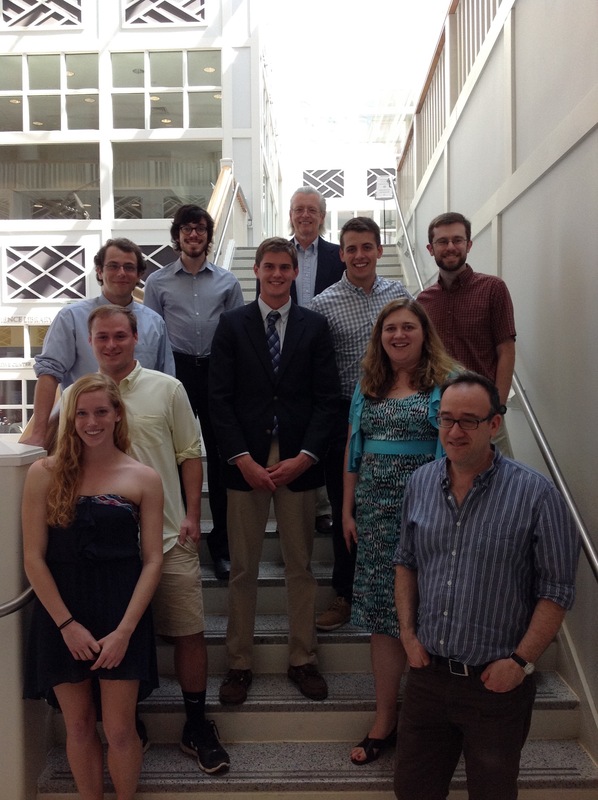 Truth is also a member of Kathekon, which serves alumni visiting campus and increases student-alumni relations. Lastly, he is a student representative of the Diversity and First-Gen Working Group at W&L, an administrative committee that strives to create a better experience for diverse groups on campus. Alicia Martinez (Seaford, Delaware) is majoring in computer science. As the head community assistant and the president of the Campus Unity Initiative, she strives to create a fun and inclusive atmosphere on campus. Martinez is an active peer tutor, has served as president of the German Club, and was selected to attend the 2018 Women’s Leadership Summit. She is a recipient of the QuestBridge Match Scholarship as well as several departmental awards, including the Jim Stump Prize in German and the John Preston Moore III Award. Click on the link for the full story…. The 2017 Senior Reception honoring the Graduates, took place on Wednesday, May 24th in the Great Hall of the Science Center. The reception provided a wonderful opportunity for faculty, students and their families gather and celebrate the students’ achievements. Here are a few photos from the festivities — Congratulations to the Class of 2017! another shot of the Graduates! During W&L’s annual Founders Day/ODK Convocation on Jan. 19th, Azmain Amin along with four honorary and 38 student initiates will be inducted into Alpha Circle of Omicron Delta Kappa (ODK), the national leadership honor society. The ceremony will take place at 5pm in Lee Chapel. Congratulations Azmain! The CSCI Reception honoring the 2016 Senior Graduates, took place on Wednesday, May 25th in the Great Hall. The Reception provided a great opportunity for faculty, students and their families to get together and celebrate. Here are a few photos from the festivities — Congratulations to the Class of 2016! Students displayed their Spring Term projects during the 2016 Festival held on May 20 on the main floor of Leyburn Library. 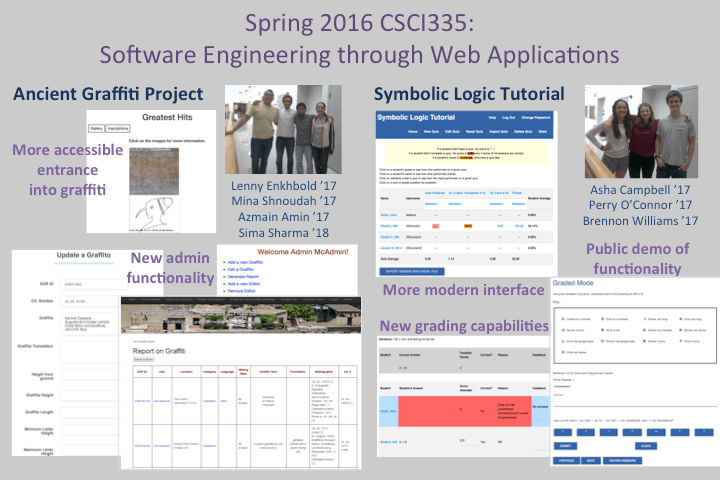 This poster below, created by students from CSCI 335, showcases the development of high-performance software for web applications. 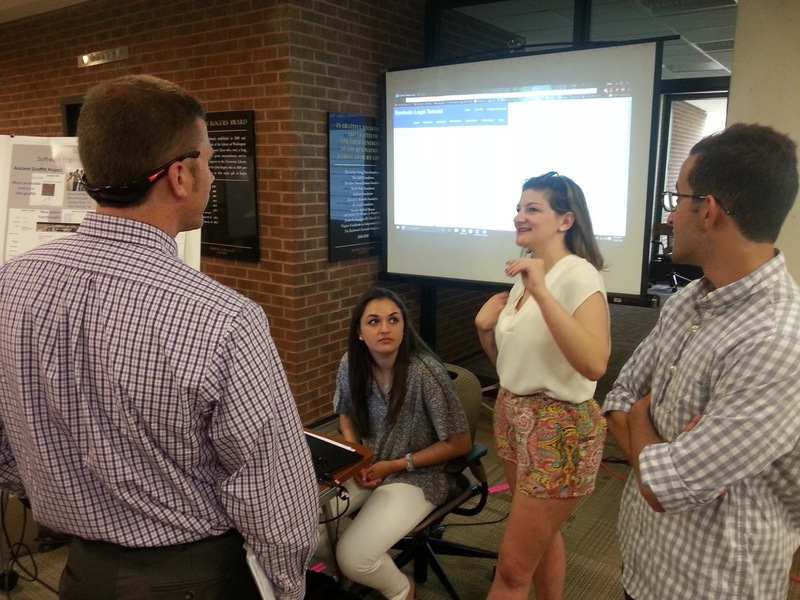 Perry O’Connor ’17 explains her team’s work on the Symbolic Logic Tutorial to Professor Gavin Fox. Asha Campbell ’17 (seated) also worked on the Symbolic Logic Tutorial. Mina Shnoudah ’17 (right) demonstrated his team’s Ancient Graffiti Project application next. Computational techniques have long been applied to biological data to address a wide range of evolutionary questions. This talk will focus on the need for accurate, efficient, scalable, and general computational methods for reconstructing gene evolutionary histories. The TreeFix algorithm that combines sequence data and species histories to correct reconstruction errors will be presented along with a demonstration of how the accurate predictions enabled by TreeFix have been used to improve our understanding of evolution. Students, Faculty/Staff invited to attend! The U.S. House of Representatives passed a resolution to raise the profile of computer science as a transforming industry that drives technology innovation and bolsters economic productivity. The resolution, H. RES. 558, designates the week of December 7 as “National Computer Science Education Week” in honor of Grace Murray Hopper, one of the outstanding pioneers in the field of computer science, who was born on December 9, 1906.